Amy from Giggleberry has a very successful business making gorgeous, gorgeous bunting and is a party Mumma after my own heart! Just like me, she just can’t help herself when it comes to adding those extra touches to making any occasion that little bit more special! Her blog is full of bunting and fun ideas and I’d highly recommend a visit! I saw this brilliant idea a little while ago on her blog and she has kindly agreed to share it with you all here on FGB. Need a cute hostess gift? How about a gift for a teenager (seriously how tricky can those ones be!) or maybe a house warming present or even a ‘just because’ gift? This idea has all of those covered – An Ice Cream Sundae Kit!! I saw THIS one from Family Bites on Pinterest and knew I would be using it! 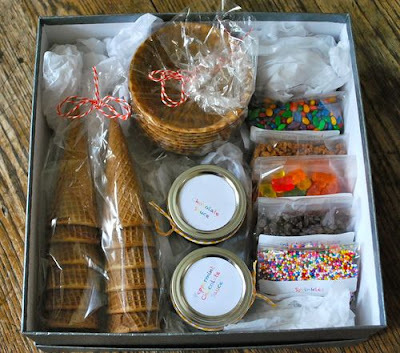 With a selection of sprinkles, some chocolate sauce (homemade or store bought), cones, tissue paper, small glass jar, ribbon and a gift box you’re ready to put your kit together… these are just the items I chose to put in the box but you could include any sundae toppings you wish! I re-packaged the sprinkles into resealable cello bags and the chocolate sauce into the glass jar then added a scrap of fabric and a ribbon to the lid of the jar. To make these extra cute you can make up some labels for everything (my printer is not playing at the moment so I went without labels). Then all you have to do is arrange your selection of goodies into a tissue paper lined gift box. This box of goodies is for a couple so I added a set of ‘My Ice Cream, Your Ice Cream‘ spoons I bought from Beach House Living to the box and was ready to pop the lid on then tie a final ribbon around the whole thing. Include a little card to let the recipient know they just need to add their favourite ice cream and you’ve got yourself one truly cute little gift that I know I would love to receive!! What a fun idea! I imagine at this time of year, you could add a bit of Christmas fun to this package with green & red sprinkles, green & red M&M’s or edible glitter. You could even add a touch of science by giving them the ingredients for them to make their very own icecream (some UHT cream, some sugar & ziplock bag along with the recipe) in the box also. You could even add another step and dip the tops, or insides, of the cones in chocolate & sprinkles, like these ones. Thanks so much Amy for letting me share this fun & simple, yet very clever idea! I love the idea of repackaging something to make it look even more exciting and adding the personal touch. 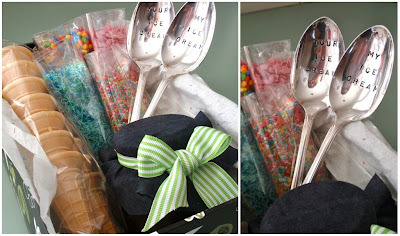 Amy has another similar idea (great for teacher gifts) on her blog at the moment over here. I also came across another repackaging idea here which even has a link (via the comments section) to the cool free labels that they used. This is the last in the series of simple handmade gifts for girls. Thanks so much to those of you who guest posted and contributed their own ideas along the way! I have just added a page on the top of my blog, collating all of the wonderful ideas! Hopefully you’ve all got some ideas for Christmas and beyond! If you have made anything from these tutorials – please let me know, I’d love to hear from you! « PRINTABLE CHRISTMAS… nativity style! Thanks for asking me to be a part of this – such a great collection of handmade gift finds!! Yay!! Unreal banana peel – sorry – I think the sundae kit brought out the ten year old in me! Great idea! Especially for some kids I know who are getting an ice cream machine for Christmas! Hey Emma – just answering the question over on my blog. I get the magnetic sheets on ebay – and have gone all magnetic this christmas! !